SAN FRANCISCO--(BUSINESS WIRE)--Today Thumbtack, the website and app that finds you local professionals (pros) for any project, announces the results from its 2017 Small Business Friendliness Survey, ranking all 50 states and 80 cities based on factors including licensing requirements, tax regulations, health and safety rules and labor and hiring regulations, among others. It’s the largest continuous study of small business perceptions of local government policy in the U.S.
Thumbtack surveyed more than 13,000 local small business owners in 50 states and 80 cities to evaluate how easy local governments make it to start, operate and grow a small business. Wyoming, Maine and Texas and Boise, Idaho, San Antonio and Grand Rapids, Mich., are among the top states and cities for 2017, respectively, each earning an A+ for small business friendliness. For complete results, please visit our interactive survey visualization: https://www.thumbtack.com/survey. Skilled professionals who found their governments to be friendly for small businesses were most likely to rate them highly on licensing requirements, tax regulations, health and safety rules and labor and hiring rules. These policies have consistently ranked among the top concerns for businesses since the first survey in 2012. Perceptions of licensing friendliness were the biggest drivers for city rankings because local municipalities and counties are often more responsible for licensing, permits and other forms and fees to run a business. Tax regulations were the biggest drivers in evaluations of state governments. There are 250,000 pros working on Thumbtack per quarter, across 1,000 different categories, serving customers in every county in the U.S. 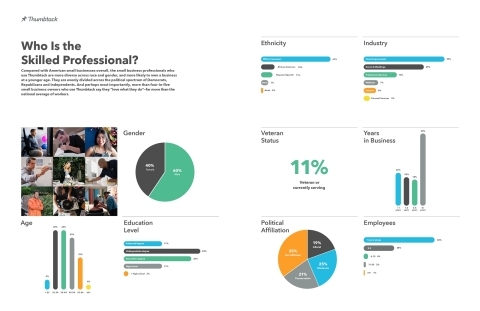 Compared with American small businesses overall, the small business professionals who use Thumbtack are more diverse across race and gender, and more likely to own a business at a younger age. They are evenly divided across the political spectrum of Democrats, Republicans and Independents. Additionally, more than four-in-five small business owners who use Thumbtack say they “love what they do,” far more than the national average of workers. Between July 26, 2017 and September 6, 2017, Thumbtack Economist, Lucas Puente, PhD, surveyed 13,284 skilled professionals from across the U.S., operating across hundreds of categories, including as electricians, music teachers, wedding planners, wellness professionals and more. The survey asked these entrepreneurs about the policies of their states and cities toward small business, as well as the overall level of support in their community. For the survey methodology, please visit: https://www.thumbtack.com/survey. Founded in 2009, Thumbtack created an inventory system for local services that can automatically match a customer with a specific need to a qualified local pro for the job. Offering 1,000 different categories, Thumbtack helped customers complete 25 million jobs -- from plumbing, to catering, to personal training and math tutoring -- generating over $1 billion in earnings to pros in 2016. Founded in 2009 and headquartered in San Francisco, Thumbtack is backed by Sequoia Capital, Google Capital, Tiger Global Management, Javelin Investment Partners and Baillie Gifford. For more information, please visit: www.thumbtack.com. 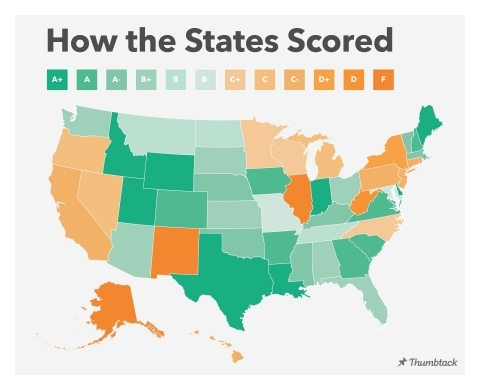 Thumbtack releases annual Small Business Friendliness Survey ranking all 50 states and 80 cities in the largest study of its kind.